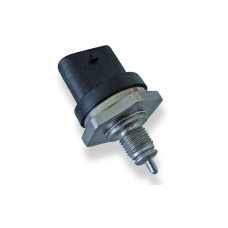 This Bosch PST-F1 sensor is designed to measure absolute pressure and temperature of engine fluids such as oil or fuel in port injection engines. Pressure range 0 to 10 bar and temperature range -40 to +140°C. The pressure measurement uses Wheatstone bridge strain gauges placed on a steel diaphragm. The on-board electronics process the measurement and provides an output as an analog, ratiometric signal. An NTC resistance element is used for temperature measurement. The main feature of this sensor is its compact design and the integration of two functions (temperature and pressure measurements) in a common housing.